Background · Melbourne Men's Group Inc.
Melbourne Men’s Group Inc. was established in 1998 and is an incorporated (No. A0092192U), not for profit, volunteer based organisation founded and operated by men, for men. 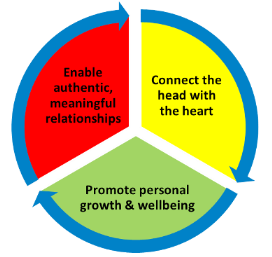 Our purpose is to enrich the lives of men by enabling authentic meaningful relationships, integrating the head with the heart, and promoting personal growth and wellbeing. We are governed by a Council of organisation members consistent with Consumer Affairs Victoria, Associations Incorporation Reform Act 2012. The office holders of Melbourne Men’s Group Inc. are David Mallard (President), Dr Roger Hilton (Vice President & Treasurer) and Damian Podbury (Secretary). Men are raised in Australia within the context of an ’emotional straight-jacket’. We still hear the damaging messages so prevalent in our culture, ‘don’t be a mummy’s boy’, ‘don’t be a sissy’, ‘big boys don’t cry’, ‘harden-up’ etc – to be accepted we learn to stop displaying emotion and not talk about how we feel. This impedes many men’s development, manifesting as emotional timidity, limited self-awareness and poor self control. It undermines the quality of relationships and has other problematic downstream impacts. It also works to isolate men from each other and reduce the possibility of achieving a balanced, authentic, mature masculinity. To address the negative implications of this cultural socialisation process and to deliver practical solutions over time, Melbourne Men’s Group supports regular Men’s Group meetings and accelerated experiential learning programs specifically for men. For over 75 years, Harvard’s Grant and Glueck study has tracked the physical and emotional well-being of two populations of men: 456 men growing up in Boston from 1939 to 2014 (the Grant Study), and 268 men from Harvard’s classes of 1939-1944 (the Glueck study). The clearest message from this 75-year study is this: Good relationships keep us happier and healthier. Period. It doesn’t matter whether you have a huge group of friends and go out every weekend or if you’re in a “perfect” romantic relationship (as if those exist). It’s the quality of the relationships – how much vulnerability and depth exists within them; how safe you feel sharing with one another; the extent to which you can relax and be seen for who you truly are, and truly see another. Given the social and cultural context most men are socialised within, developing and maintaining quality relationships is a challenge. This is where the value of Melbourne Men’s Group experiences cannot be underestimated.